Christmas has come and gone. Just a few days before Christmas, your Tipster turned 66 and, to the amazement of all, did not crumble to dust. I had a lovely birthday evening with Sainted Wife Barb, son Ed, daughter Kelly and cat Simba. We had pizza and pasta from what has become my favorite local pizza place, hooked up our new family gift – a Ultra HD Blu-ray player – and watched Wonder Woman, which is my favorite of the DC Comics movies. Not to mention hundreds of online greetings from my friends and readers. It was a good day to not crumble to dust. While gearing up to finish writing Black Lightning: Cold Dead Hands and plan my next works, I have been reading chunks of comic books. I’ll never again be a “read the new comics as they come out” kind of reader. It doesn’t fit my lifestyle. But I really enjoy reading several issues of a title at a time. Darth Vader #1-9 [Marvel; $4.99 for #1, $3.99 each for the rest] is set after the Clone Wars. The Jedi have been defeated and most of them are dead. Palpatine is emperor. Anakin Skywalker has gone to the Dark Side of the Force, defeated and left to die by Obi-Wan Kenobi, and had his life preserved by Palpatine inside cybernetic armor. Thanks to a handy “what has gone before” prologue to these issues, you’d never know I haven’t seen Star Wars II, III and VIII. Kudos to Marvel for including these introductions in all their Star Wars comics. I enjoyed these nine issues, despite their protagonist serving the most evil man in the galaxy and destined to become a mass murderer of planetary proportions. The Emperor is molding Vader with “tough love” and demanding his protégé prove himself at every turn. Vader faces overwhelming odds in his training and missions. This reader can’t root for him, but can’t deny his determination and skill in these matters. Writer Charles Soule presents Vader with both worthy challenges and adversaries. Vader has had to forge his own light saber by taking and corrupting one from a Jedi he defeats in battle. In the latest issues, Darth is hunting down Jedi archivist Jocasta Nu, who is a fascinating character in her own right. The odds don’t seem to be in Nu’s favor, but I’m hoping she survives this story. Penciler Giuseppe Camuncoli hails from Italy and has drawn comics for DC (Hellblazer) and Marvel (Spider-Man). In these comics, he’s captured the Star Wars universe and shown his proficiency with the action, the human drama and the storytelling. Inkers Cam Smith (#1-6) and Danielle Orlandini (#7-9) have complemented Camuncoli well. Colorist David Curiel has added great atmosphere to these comics. Kudos to editors Jordan D. White and Heather Antos for their roles in putting together a terrific creative team and facilitating that team’s ability to tell amazing stories. 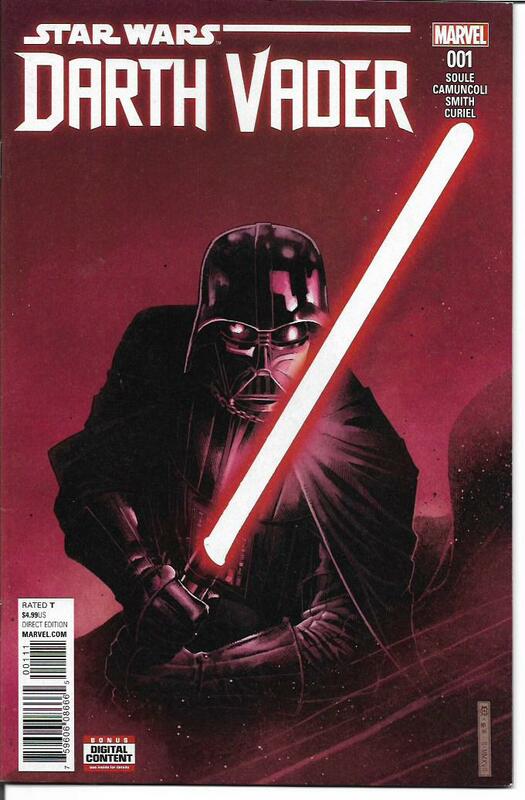 The first six issues of this title have been collected in Star Wars: Darth Vader: Dark Lord of the Sith Vol. 1: Imperial Machine [$17.99]. I recommend this series to hard-core and casual Star Wars fans alike. These are some excellent comics and so earn their place as my pick of the week. 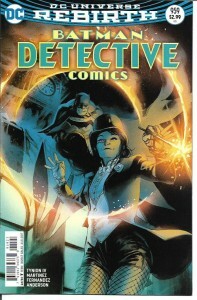 I also read Detective Comics #958-966 [DC; $2.99]. Since “Rebirth,” I’ve been enjoying Batman more than I have in years. He is far more sane that he’s been in years, still driven but no longer so driven as to be a menace to himself and others. He has enlisted people in his war on crime who he doesn’t treat like pieces on a chessboard. He seems honestly concerned about them and not merely in terms of his battle plans. There are still some rough edges for me. To name one example, more Bruce Wayne screen time is needed. Zatanna, especially in her traditional magician’s costume, has been a favorite of mine since I “met” her in 1964. She appears in #958-962. I like how writer James Tynion IV writes her. Artists Alvaro Martinez (pencils), Raul Fernandez (inks) and Brad Anderson (color) did an excellent job on the visuals. That was followed by a two-issue story that had great moments for Clayface (maybe my favorite of Batman’s teammates) and the Spoiler. The story was by Tynion and Christopher Sebela with script by the latter, art by Carmen Carnero and color by Ulises Arreola and Kelly Fitzpatrick. Issue #965-966 kicked off “A Lonely Place of Living” by Tynion IV, by artists Eddy Barrows and Eber Ferreira with color by Adriano Lucus. This loses me a bit for a number of reasons. I’m not fond of alternate universe and time travel stories. I’m also not yet sold on the “Mr. Oz” event running through several DC titles. Maybe it will grow on me, but I’m not there yet. Issues #957-962 are collected in Batman: Detective Comics Vol. 4: Deus Ex Machina [$16.99]. Detective Comics Vol. 5: A Lonely Place of Living [$16.99], which will collect issues #963-968 plus Detective Comics Annual #1, will be published in April of 2018. I love the new DuckTales cartoon series airing on Disney XD. But, as much as I hate giving a negative review during Christmas week, IDW’s DuckTales comic books [$3.99 each] are not anywhere near as much fun or as well-crafted as the cartoons. They purport to be the daring adventures of Scrooge McDuck, Donald Duck and Della Duck. Almost every story in issue #0-4 had the same basic structure. They open at the conclusion of an adventure with Donald in some embarrassing situation. After removing any suspense with these openings, the stories go back to relate what happened, ending with a shot of poor suffering Donald. I have been buying all of IDW’s Disney titles, but DuckTales has been taken off my list. It doesn’t entertain or interest me. Since your mileage might vary, I suggest you first seek to borrow these comics from your local library. DuckTales: Treasure Trove [$9.99] reprints issues #0-2 and will be published in January. 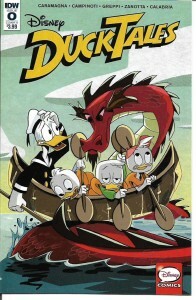 DuckTales: Mysteries and Mallards [$9.99] with issues #3-5 will be published in May. Christmas is eight days away as I write this week’s column, which means you’ve either finished your holiday shopping for the season or that you aren’t reading this because you’re running around like a maniac trying to finish your shopping. If it’s the former, good for you. You deserve to kick back with a good comic book or graphic novel. Or maybe binge-watch one of the broadcast or streaming comic-book series your holiday preparation has kept you too busy to watch. Me, I need to finish the Punisher, start the Runaways and catch up on Agents of S.H.I.E.L.D., iZombie and the Gifted. Of the shows I’m current with, I’d most recommend Lucifer, even though a devilishly good time might seem at odds with this particular holiday season. As for more substantial comics reading, there are so many terrific collections I wouldn’t know where to begin with my recommendations. Actually, I do know where to begin. That would be the several thick collections of Stan Sakai’s Usagi Yojimbo. As I’ve said, I believe Sakai is our greatest living cartoonist. Beyond that amazing saga, there are many other wonderful comic-book omnibuses and comic-strip collections. I’m looking at the Swamp Thing Bronze Age Omnibus across from my desk and a stack of books that includes the Pogo volumes lovingly gathered by Caroline Kelly, the daughter of Pogo creator Walt Kelly and a remarkable person who left us too soon. Enjoy the holidays, my friends, but also remember those who aren’t with us this year. 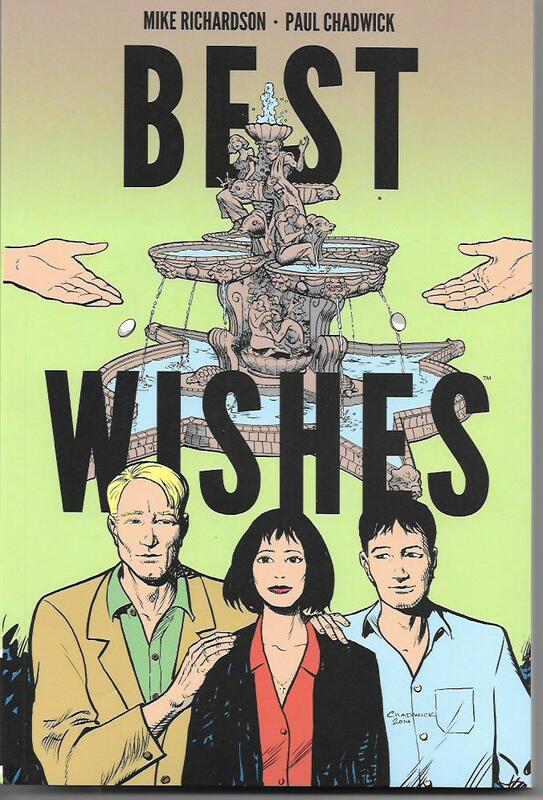 Best Wishes by Mike Richardson (story) and Paul Chadwick (script, art, lettering) is my pick of the week and one of the best graphic novels I’ve read all year. The black-and-white graphic novel [Dark Horse; $19.99] is a modern-day romance set in New York City and one that played out like a great movie in my head. An ornate fountain from the old world, transplanted to Central Park to receive the coins and attendant wishes of those who bask in its beauty and feel its magic. Two strangers, a man and a woman, both graphic artists. One seeks fame and respect. The other seeks love. Fate draws them together as the city launches a competition for a new symbol. Lead characters Cal and Mary are expertly made; we get to know them and root from them, even when they’re at odds with one another. The supporting characters aren’t all as vivid, but Mary’s pro football player boyfriend is going to offer a great opportunity for whatever actor plays him in the movie that ought to happen. I love Best Wishes so much I’ve already bought extra copies to give to friends. I’ll be amazed if it’s not a contender for next year’s best graphic novel in the Eisners and every other awards. It earns my highest recommendation. When it comes to weird humor, I can always count on manga offering me something I never expected. 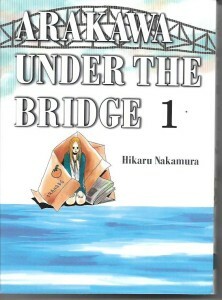 Hikaru Nakamura’s Arakawa Under the Bridge 1 [Vertical Comics; $17.95] is fascinating, funny and very, very odd. It’s the story of Kou Ichinomiya, a young man who is the future owner of a vast corporation and who has already, while still in school, become a success on his own. Raised by a single parent, his father, Kou has had the rule “never own anyone” branded on his soul. His life takes a strange turn when he accidentally falls into the Arakawa River and almost drowns. Kou’s rescued by Nino, a homeless woman who claims to be from Venus and who lives living under the Arakawa bridge. He must repay her, but, when he asks how, she asks him to teach her about love. They become boyfriend and girlfriend as Kou moves into his own makeshift home under the bridge. From there, things get even more strange for the wealthy young man. There is an entire community of increasingly odd “citizens” living under the bridge. They range from a man who pretends to be a kappa (demon) and who is the chief of the village to Sister, a powerful ex-soldier who dresses as a nun, to Stella, a little blonde orphan from England who considers herself to be the gangster boss of the Arakawa Bridge people. Kou tries to navigate his crazy new life as the relationship between him and Nino grows. It’s a heartwarming, hilarious love story. This Vertical volume combines volumes one and two of the manga into a single 366-page book. Arakawa Under the Bridge has been an anime series, a TV drama and a live-action film. The original manga runs to fifteen volumes. This quirky romantic comedy won’t be to every reader’s taste, but I loved it. Next time you’re looking for something different from comics, give it a try. 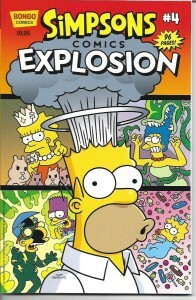 Simpsons Comics Explosion #4 [Bongo Comics; $9.99] is 96 pages of full-color fun. The yearly reprint special is filled with classic comics stories. Writer Ian Boothby, who always delivers hilarious scripts, is represented by “Stand by Me” (in which Homer gets a job standing next to people to make them look good); “Power Plants Vs. Zombies (a spoof of the popular video game); “Now You Wiggum, Now You Don’t (Chief Wiggum gives Homer a pass in exchange for Homer’s watching Ralph); and “Dial ‘M’ for Milhouse!” That last one is one of my all-time favorite Simpsons comics stories featuring Milhouse gained transformative powers. One of his super-hero identities is Electroshock, who resembles my own Black Lightning. Bongo’s Simpsons comic books are always worth picking up, but this annual is exceptional. Just the thing to occupy those long days at the nuclear power plant. What’s the worst that could happen? The holidays are nearly upon us. As has been the blessed case for years now, there is a wealth of collected editions of comic books, graphic novels, manga, books on comics history, comic-book movies, season sets of comics-based live-action TV series and comics-based cartoons and all manner of comics-related apparel including caps, t-shirts, socks and undergarments. If you’re shopping for a comics fan, you have more gift choices. If you’re a comics fan yourself, assuming you haven’t been naughty, those that love you won’t have any trouble finding all sorts of great gifts. I see “Tony’s Tips” as being your year-round shopping guide. Most of what I write about here would be suitable for birthday, holiday and other special occasion presents. The column is sponsored by the fine folks of InStock Trades, one of my favorite online retailers because of the vastness of their inventory and the excellence of their service. If you enjoy this column, check them out. Regular readers of this column know I tend to read comic books in batches. As much as I would love to read comics as I get them and be current on all the titles that interest me, I know that is not going to happen any time soon. Writing comic books and other stuff doesn’t give me the time to read all the comic books I would like to read, at least not in any timely fashion. My haphazard reading habits put Batman #24-29 [DC; $2.99 each] in my hands this past week. Written by Tom King, this run includes a seemingly pivotal Batman/Catwoman story penciled by David Finch; the first four chapters of “The War of Jokes and Riddles” with art by Mikel Janin and an interlude tale featuring Kite-Man penciled by Clay Mann. 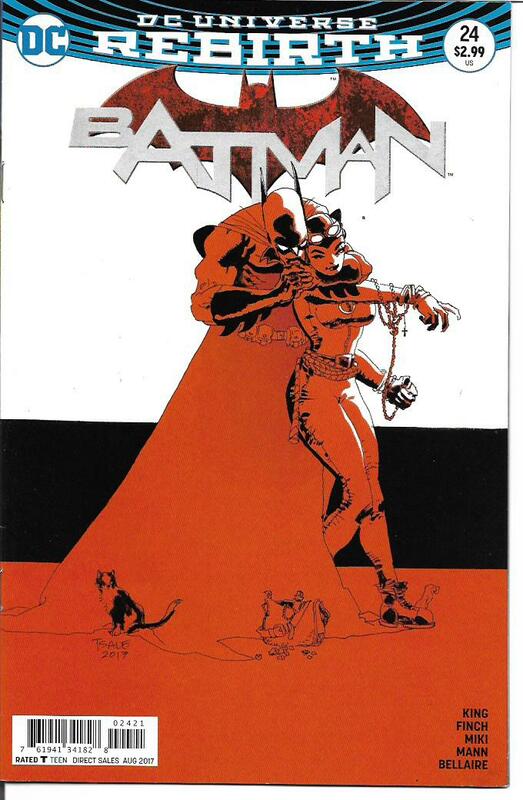 The Batman/Catwoman story wraps up some loose ends from a previous story arc and had some really nice moments in it. Batman advises a young super-hero whose powers can kill her. She asks him a pointed question about his own life. And the Bat’s relationship with Selina Kyle is re-framed in an intriguing way. “Intriguing” is a word I’ll be using again in this review. In any case, I did like this issue quite a bit. “The War of Jokes and Riddles” is an adventure set earlier in the Batman’s career. The Joker and the Riddler are battling for control of Gotham, each having recruited other villains. Oh, both parties want Batman delivered to them before they’ll even consider a truce. Though the strategies of the war are intriguing, I have all sorts of problems with this story line. These problems are not exclusive to this story. Most major comics villains are overused and the Joker tops that list. The brutality of these villains makes Batman look like a chump. They kill lots of people. They will suffer no meaningful consequences for their mass murdering. They will either be captured or “die” and then they will return to slaughter more people. Boo on that. King does earn considerable points for his use and re-invention of Kite-Man, a long-time favorite of mine even before I revealed – in an issue of Hawkman – that his name was Charles Brown. That element combines with solid writing and art to keep me reading this story. Batman Vol. 4: The War of Jokes and Riddles [$19.99] is scheduled to be released any day now. It collects issues #25-31. If you like tales of Batman’s early days and his admittedly legendary villains, you might want to put this book on your wish list. 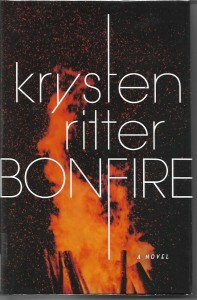 Bonfire by Krysten Ritter [Crown Archetype; $26] is the first novel by the actress playing Jessica Jones on the Marvel/Netflix series. She is also founder of Silent Machine, “a production company that aims to highlight complex female protagonists.” This novel’s Abby Williams is one such protagonist. The book is a little choppy in places and I’m not wild about every element of its ending. On the plus side, Williams is a compelling character, a woman haunted by her small-town history who returns to her birthplace as an environmental lawyer to investigate the town’s major benefactor and employer. Ritter does an equally good job in creating the small town and helping her readers experience the good and the bad therein. Add the palatable evil that underlies Abby’s aversion to her old home town – Ritter doesn’t hesitate to create truly evil villains – and this first novel scores a recommendation from me. It’s not comics per se, but I think fans who have enjoyed Jessica Jones will enjoy this novel as well. 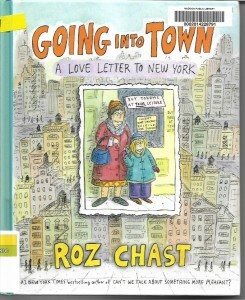 My pick of the week this week is Going Into Town: A Love Letter to New York by Roz Chast [Bloomsbury USA; $28]. A New York Times best-selling author, Chast created a little booklet on the city for her daughter who was attending college and living in Manhattan. As she says in her opening chapter, the cartoonist wanted her child to get off on the right foot with New York. Born in Brooklyn and now living in the suburbs, Chast lived in New York in between those two destinations. In this charming, amazingly informative book, the cartoonist celebrates New York and the many wonders to be found there. From the basic layout of the place and just walking around the city, Chast takes us into the subway, shows us stuff to do, describes the flora and fauna, tells us about the food and even offers insight into New York City apartment life. As someone rediscovering his love of the city – I hated the place by the time I moved back to Ohio and for decades afterward – I found her book nothing short of delightful. Comics and cartoons can tell all sorts of stories. This book is the story of a city. Not a dry history, but a lively guide to the New York of today. I recommend it to one and all. That’s all for this week. I’ll be back next week with another trio of reviews for you. Be well. Old heroes don’t die and, if they are comics heroes, they usually don’t even fade away for long. In this week’s column, we’re looking at some classic heroes who have been with us since the 1930s, the 1940s and the 1950s. Lee Falk’s Mandrake the Magician, whose newspaper strip launched on June 11, 1934, was a character I always kind of sort of liked even as I found it wanting. Mostly because I never bought that his sole actual “supernatural” ability was super-hypnotism. Some of what he did with that power defied the contention it was all in the minds of those around him. Also, though in later years, Falk attempted to set this right, Lothar disturbed me from the first time I saw him. Allegedly royalty, the amazingly strong Lothar wore stereotypical animal skins, spoke broken English, was easily confused and seemed more servant that friend or partner. I read Mandrake sporadically in the newspapers. My first sustained exposure to him was in the mid-1960s when King Comics published ten issues of a Mandrake comic book. The stories were mostly based on newspaper strip stories with, initially, art by moonlighting Marvel artists Don Heck and Werner Roth. The stories in the later issues included some that were originally produced by Italian writers and artists. Back then, I found these comic books enjoyable but not especially outstanding. 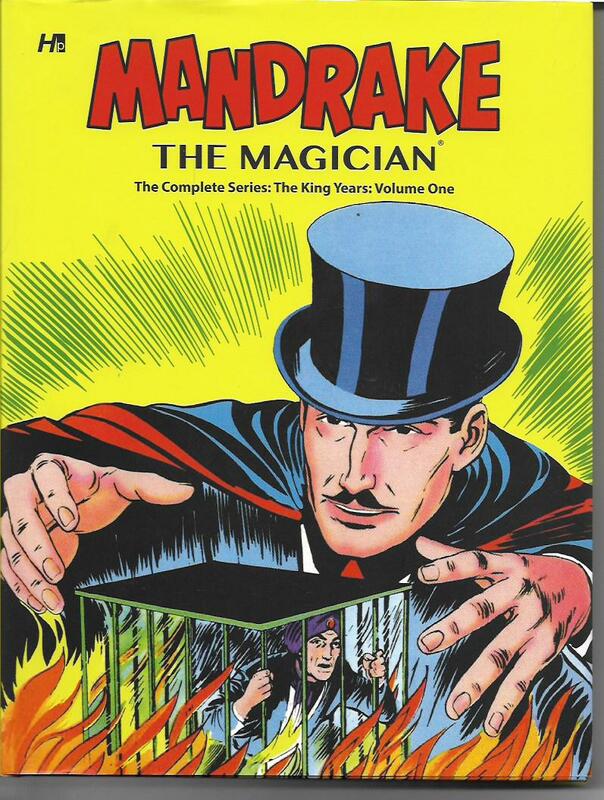 In 2016, Hermes Press collected all of these comic-book stories in Mandrake the Magician the Complete King Years: Volume One and Two [$49.99 each]. Those hardcover books recently made the way to the top of my reading pile. The presentation of the comics was first-rate. It was fun revisiting the stories for the first time in four decades. I appreciated the informative introduction in the initial volume and the dual interviews with Fred Fredericks, who drew (and later wrote and drew) the newspaper strip from 1964 to 2013. As a bonus, the second Hermes volume also reprinted Dell’s Four Color #752 featuring original Mandrake stories written by Paul S. Newman and drawn by Stan Campbell. Coming back to these comics stories gave me warm gooey feelings of nostalgia. It was a time when new comics publishers like King and Tower were trying to gain a foothold on the newsstands, when some older publishers like Archie and Charlton were trying new things, when the American Comics Group (ACG) was still around doing comics like no others and when publisher Jim Warren was engaging me with Creepy, Eerie and Blazing Combat. It was an exciting time to be a teenage comics reader with enough part-time jobs to be able to buy a lot of comic books. Then and now, I thought these Mandrake comic books were fun. If you lack my nostalgic impulses, Mandrake the Magician Volumes One and Two are too expensive for your casual reading. You can get them at a nice discount from InStockTrades, which sponsors these weekly “Tony’s Tips” columns, but they still aren’t for every fan. Just for those of us who still get a kick out of Mandrake gesturing hypnotically and maybe making some magic happen. To those willing to abandon their disbelief, which includes yours truly, I recommend both volumes. 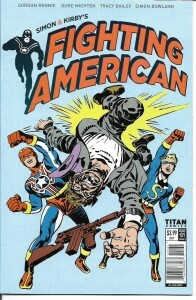 I read and mostly enjoyed Fighting American #1-2 by Gordon Rennie with artist Duke Mighten [Titan Comics; $3.99]. The title hero was created by Joe Simon and Jack Kirby in the 1950s. At first, it was pretty much a Cold War reboot of their Captain America. Then they ran with the excesses of the Joseph McCarthy Era and turned into a brilliant parody of patriotic heroes. Fighting America is one of my favorite Simon/Kirby creations. Rennie and Mighten have created a half-continuation and half-reboot of the original comics. In their version, Fighting American and his sidekick Speedboy have been propelled into the future to battle an old enemy. They end up stuck in our time with Speedboy getting all wide-eyed at the more open displays of sexuality he sees while his adult partner scorns these modern mores with speeches that wouldn’t have been out of place on the 1960s Batman TV shows. Not all of the humor works. Sometimes it’s overplayed. But, regardless of the few bumps in the road, these were fun comic books. I’m in for the long haul and recommend you give the title a chance. Fighting American Volume 1 [$16.99], a trade paperback collection of what I’m guessing is the first five issues, is scheduled to be released in May of next year. This week’s top pick of the week is The Green Hornet ‘66 Meets the Spirit #1-5 by Fred Van Lente and artist Bob Q [Dynamite; $3.99 per issue]. There are mysteries galore in this adventure, all of which are resolved entertainingly. There are wonderful character scenes with the heroes. There’s an Will Eisner-esque vignette about a man name of Hypnos Schnooze that fits magnificently into the all-around story. This series was a delight on every level. The Green Hornet ’66 Meets The Spirit will be collected in a trade paperback [$19.99] in May of next year. 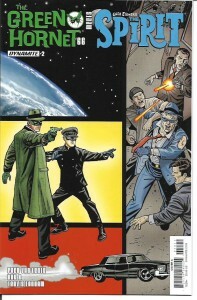 If you’re a fan of either the Green Hornet TV series or Will Eisner’s landmark Spirit comic, you’ll love this book. If it were already available, I’d buy a few copies for Christmas/holiday gifts. One last note. I’m putting together my 2018 appearance schedule as we speak. If you’re a promoter who would like be as a guest at an event or convention, now’s the time to contact me to discuss terms of such an appearance. I’ll respond as quickly as possible to all such inquires. Another one last note. Black Lightning: Cold Dead Hands #2 should be in the comics shops this week. That I urge you to buy this six-issue series is a clear conflict of interest. I hope you can find it in your hearts to forgive me…and again when I do exactly the same thing for issues #3-6.